Get super-fit skin with Effusion Twice A Day Active Cellulite Cream. A fast-acting, skin heating and firming formula that boosts circulation, visibly diminishes the appearance of cellulite and helps to tighten your skin, leaving it firmed, smoothed and invigorated. BODYFIT™ in trial, showed 43% cellulite reduction and 20% increase in skin firmness. Once a Day Body Scrub and Twice a Day Active Cellulite Cream provide a combined scientific and cosmetic approach to smoother, more toned looking skin on the legs, thighs, bottom, stomach and upper arms. High strength active ingredients and light-diffusing concealers in our leading edge formulations instantly beautify the body. 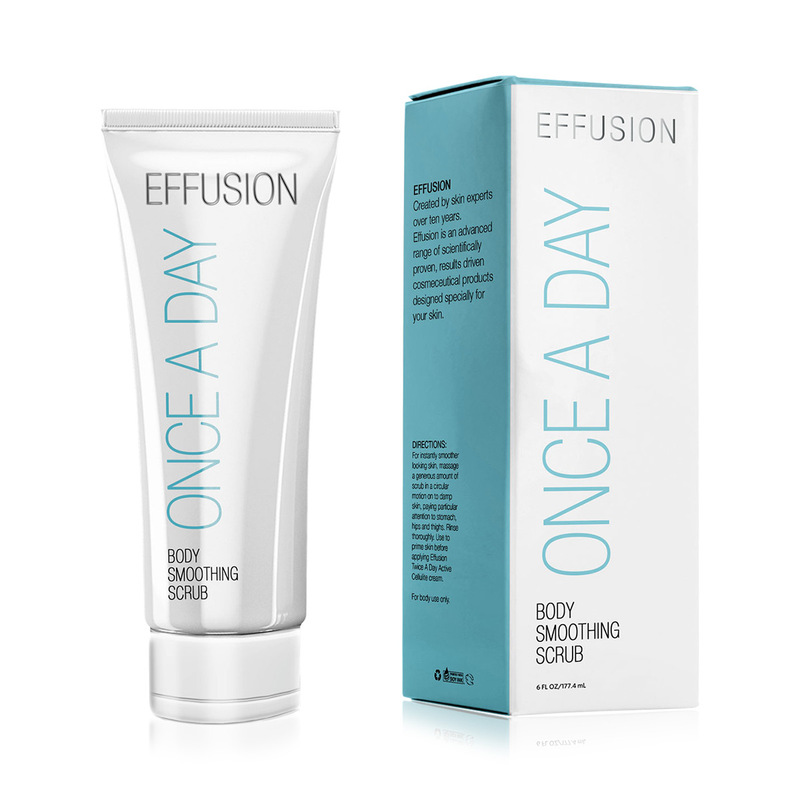 Slip into a new skin with Effusion Once a Day Body Scrub, the perfect partner for Effusion Twice a Day Active Cellulite Cream. This advanced exfoliator preps skin using a patented power blend of plant actives together with stimulating caffeine and soothing aloe in a microbead-free formula of Ground Shea Nut Shell grains suspended in a fresh, clear gel. Make cellulite a thing of your past. Fight fat pads and dimpled, orange peel skin; slim the silhouette; firm up, smooth out and instantly conceal the appearance of cellulite using Effusion, our treatment collection that really delivers. Once a Day Body Scrub and Twice a Day Active Cellulite Cream provides a combined scientific and cosmetic approach to smoother, more toned looking skin on the legs, thighs, bottom, stomach and upper arms. High strength active ingredients and light-diffusing concealers in our leading edge formulation instantly beautify the body. We have harnessed the very latest in scientific research using emerging ingredients that mimic the effects of endurance training to improve body tone. Patent-protected actives combine to give cellulite the runaround so you don’t have to, smooth on and shape up! This truly revolutionary body-contouring cream heats up after application to stimulate the body’s fat-burning processes while offering instant cosmetic improvement using the magic of the light reflecting formulation. Slip into a new skin with Effusion Once a Day Body Scrub, the perfect partner for Effusion Twice a Day Active Cellulite Cream. This advanced exfoliator preps skin using a patented power blend of plant actives together with stimulating caffeine and soothing aloe in a microbead-free formula of Ground Shea Nut Shell grains suspended in a fresh, clear.